HomeRESOURCESEducationBIM and Landscape Architecture: What, Why, and How? Somewhere along the progression of CAD to BIM, there is an in-between phase of more basic 3d modeling, where you can find computer programs like SketchUp, Rhino, and 3ds Max. Programs like these allow you to create digital 3d models, but these models have almost no information in them and, as a result, are fairly limited in their use. These models are great for design visualization, but they do not allow for for scheduling of quantities or materials. And these programs do not facilitate the creation of construction documents from the model nor allow for coordination between models. Thus, the critical difference between basic 3d modeling and BIM is the information (or data) within the model. The idea being that every object in the model has data that is pertinent to that object. 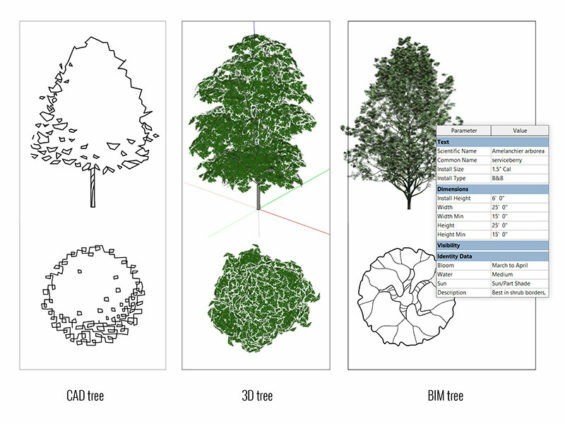 For example, a tree within a BIM landscape would have the parameters necessary to install the tree, such as its scientific name, root size, condition, and install height. It could also have relevant design information such as the mature height, spread, water and sun requirements, and bloom time. Having this information in the model allows for quantity scheduling, material takeoffs, model coordination, and also automates the documentation process. As a designer, the information in the model can also start to drive critical design decisions, such as how to best capture and store rainwater. Once the project goes into bidding and construction, the BIM process allows for more accurate cost estimates and scheduling, reduces design errors and changes on-site, and facilitates a more coordinated construction and delivery process. So the benefits of the BIM process can be distilled into a single concept: it is more efficient, and thus saves money. And money is a powerful motivator, so it is no surprise that architects, contractors, and even clients are all moving to adopt and even require BIM on their projects. For landscape architects, this shift to BIM can be a bit unnerving. It is quickly becoming the industry standard and in the UK there is now a BIM mandate on all public sector projects. However, while it is relatively easy for architects and building engineers to transition from CAD to BIM, there remains a software gap once you move out into the landscape. So as a landscape architect, what are the options if you want to move from CAD to BIM? Unfortunately there is no magic bullet, no perfect program, and the answer will vary depending on the project and project team. This wide array of answers is due to several factors: first, landscape architecture is a very broad field and projects can vary widely in size, scope, and detail. In addition, landscape architecture is a relatively small discipline, especially when compared to architecture or even civil engineering. And as a result, there are far fewer programs that will cater specifically to our needs. 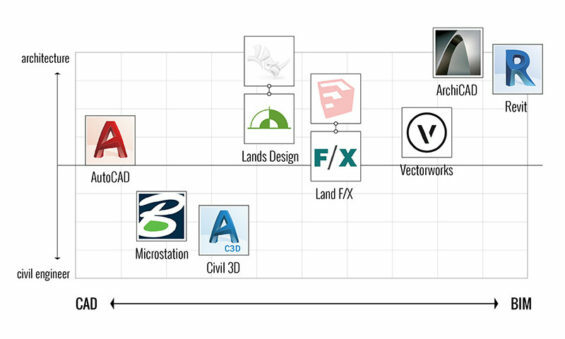 The graph below maps some of the most commonly used landscape architectural software. Along the x-axis, each software was given a BIM ranking, determined by its parametric 3D modeling and database capabilities, while its placement along the y-axis was determined by the discipline-specific features available within the software (ranging from architectural to more civil engineering). Starting at the CAD end of the spectrum, Microstation and Civil 3D are definitely more civil and infrastructure focused. And though these programs have extensive 3D modeling capabilities, their parametric and database capabilities are quite lacking, so they scored low on the BIM ranking. In the middle of the graph, there are some landscape architectural-focused plug-ins that give BIM-like capabilities to more basic modeling programs. Lands Design is a plugin for Rhino and Land F/X is an add-on for SketchUp (and AutoCAD). Both of these programs have specific tools and databases for planting, irrigation, and site furniture, however those databases are limited and they do not have full parametric modeling capabilities. Finally, in the upper right corner are the most fully integrated BIM programs: Vectorworks, ArchiCAD, and Revit. Of these three, only Vectorworks offers a package specifically for landscape architects (Vectorworks Landmark). However, it is worth noting that Revit is the market leader among these options, particularly in the United States and Australia. And even though some people think that “Revit is not a viable landscape architecture solution,” more and more landscape architects are using Revit to deliver landscape BIM projects. Interested in learning more about how Revit works (and doesn’t work) for landscape architecture? Stay tuned for the next part in the series, which delves into the specifics of using Revit to model landscapes. 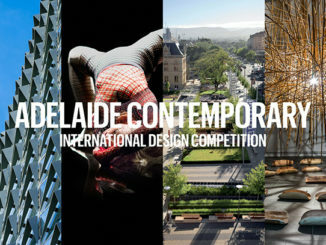 Lauren Schmidt is a graduate landscape architect and the author of landarchBIM, a blog and website that focuses on BIM and design computation in landscape architecture. She is an avid Revit user and has also created an online video training course, Revit Landscape: An Introduction to Revit and Site Modeling. 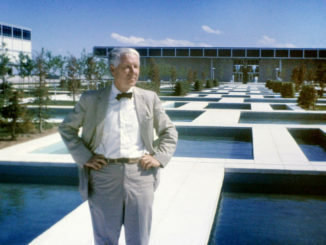 2 Comments on BIM and Landscape Architecture: What, Why, and How? Hi! I’m an educator from Singapore Polytechnic teaching Landscape Architecture. 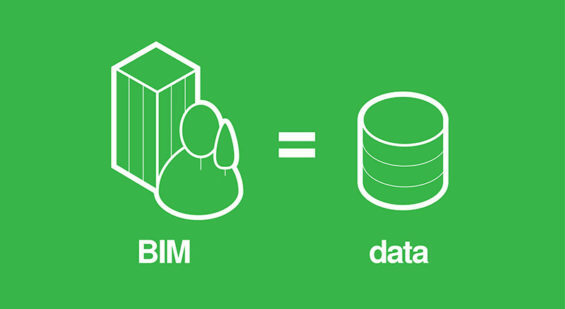 As far as our region concern, BIM is still a taboo subject that most LA shun. I guess the main reason is that the support for Landscape sector is limited in BIM. No one is doing the objects for the industry compared to architectural related objects and families. So if the industry is not leading, then the education sector will be the leaders where we will train our graduates to use BIM for modelling and information capturing. In fact, we have started BIM as part of the computer aided modules. And thank you for this article and link, I think I have a better option to learn BIM and teach the younger generation. We’re an Architecture + Landscape practice, as are many firms in the UK. What swayed us towards using Revit for Landscape is not the tools available to us in Revit, but the fact that it’s seamless with our site modelling for the building. My current project has a basement car park, a podium that merges with the landscape, a new public square and a pedestrianisation scheme for the adjacent street. All of that needs to be in a single coordinated model which includes the topography, trees, hedges, planting, paving etc and it’s much easier to do that on a single platform like Revit.